More drama in the Dobie household. 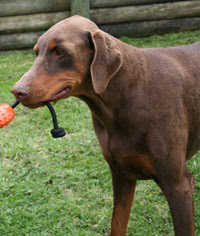 My four-year-old Doberman, Chase, has hypothyroidism (low circulating thyroid level) and is on Thyroxin tablets to manage the lifelong condition. This morning, hubby and I accidentally doubled up on Chase’s pills, sending me into a panic as I didn’t know if the overdose would pose a threat to him. It was 6.30am – in the middle of getting our daughter ready for preschool, having breakfast etc (which explains the double-up with the pills!) – so I called the 24–hour emergency vet and felt a little better when I found out the dosage we had given Chase was unlikely to cause any health risks (heart attack or stroke), but that I should keep an eye on him throughout the day just in case. My visiting brother doggy sat at home for me – turns out Chase spent the day chasing birds off the trees in the backyard, playing tug-o-war with my other Dobie, Logan, and digging up creepy crawlies around the fenceline. I don’t know why I worry about that dog so much. He is a tough ‘Doberboy’ who has been known to run full speed into a wall and then continue running like nothing ever happened. I wonder if he has a metal plate in his head that the breeder failed to mention? I’m glad I prepared the vet for an emergency visit, though. Better safe than sorry, even for a bionic dog like Chase.